Challenge yourself climb to new heights! 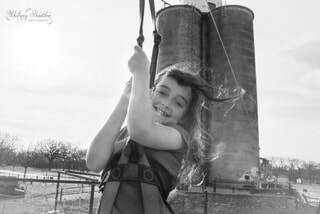 This is Kailyn riding our new zip line! Thanks to Whitney Shadden Photography for this photo. Zip line ride is $5. $10 for 2 rides. Zip/Climb one of each $10. We are open starting on Saturday, March 2nd. bring the waiver with you. ​Located In Hico, next to the walk path. Appointments available if climbing is desired other times than open hours. ​$10 for 2 climbs and play on Low Ropes course. Bouldering: climbing up a short distance w/o harness or rope. Traversing: climbing around the gym about a foot off the ground. Routes: There are many new routes to climb inside. No experience necessary to climb.